Is Manny Pacquiao the greatest Filipino fighter of all time? Think for a second before you answer that question. At first you may wonder if calling Manny Pacquiao the greatest Filipino fighter ever is something like saying Marlon Anderson is the best lefthanded pinch-hitter in baseball named Marlon. The pool isn't that big, right? You would be wrong to think that. Flash Elorde and Pancho Villa are in the Hall of Fame. Ceferino Garcia was a legendary champion and Luisito Espinosa was a very good two-division champ. We asked some experts to weigh-in on the Pac Man question. 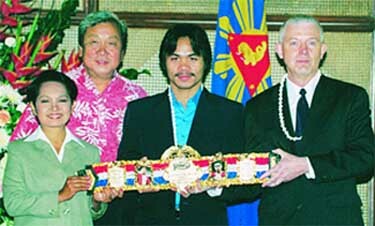 Nigel Collins, the editor-in-chief of The Ring magazine, visited the Philippines to present Pacquiao with The Ring belt (see photo above). Here is his take: "In terms of what he’s accomplished, I think Manny Pacquiao has surpassed all other Filipino fighters, including Pancho Villa and Flash Elorde. Villa died young, so we don’t really know what he would have achieved otherwise, but Elorde had a long and glorious career. Still, Elorde lost 25 fights and was stopped twice by Carlos Ortiz when he moved up and tried to win the lightweight title. Pacquiao, on the other hand, has already won world championships or alphabet titles in five different divisions. Moreover, the quality of his opposition compares very favorably with Elorde’s. Overall, I think it’s best to wait until a fighter’s career is over before deciding his place in history, but the way Manny is going there’s no doubt he’s going to be up there with the all-time greats." Steve Farhood, boxing analyst, Showtime: "As for Pac-Man, given his status as the best fighter, pound-for-pound, in the world and the quality of his victims (specifically the Mexican triumvirate of Barrera, Morales, and JM Marquez), there can be little argument that Pacquiao is the best Filipino ever. And don't forget, he isn't finished yet. Imagine how big he'll be if he can beat Oscar. Flash Elorde is held back by his failure to beat Carlos Ortiz (twice). Pancho Villa was a great little man, and he deserves consideration because he beat Jimmy Wilde. Those are the only other Filipinos who are close. Regardless, Pac-Man is THE Man." Now, boxing historian Mike Silver is going to challenge you to think a little bit. Silver is the author of the forthcoming book, “The Arc of Boxing: The Rise and Decline of the Sweet Science." Here's his take: "Manny Pacquiao may be the best pound-for-pound fighter in the world today but that accolade does not automatically make him the best Filipino fighter of all time. The top fighters of the first five decades of the last century had a much more difficult path to traverse before they became top contenders or world champions. In terms of activity, competition, experience, and acquired boxing skills, the old-time champs and top contenders easily eclipse their modern-day counterparts. The Filipino champs of the past were no exception. The competition faced by Pacquiao does not compare to that of Ceferino Garcia, Flash Elorde or Pancho Villa, whose records read like a who’s who of boxing greats. Manny, whose boxing skills are limited, to say the least, relies on strength, power, toughness and relentless pressure to win. I’m certainly not belittling these virtues but decades back you needed more than that to reach the heights and stay there. If we time travel Manny back to the 1920’s to the 1960’s he would not have stood out in the way he does today and the question of his possible superiority over Villa, Garcia and Elorde would not even be asked. Ceferino Garcia: His record is quite remarkable. From the moment he arrived in this country Garcia faced a veritable who’s who of great fighters in both the welter and middle divisions. I could find only a handful of second or third raters in his record. Competition included Barney Ross (three close decisions), Henry Armstrong (twice, including one draw), Young Corbett III, Freddie Steele, Ken Overlin, Steve Belloise, Lloyd Marshall, Billy Soose and, in his 105th pro fight (Garcia had many more unrecorded fights in the Philippines) he knocked out the great Fred Apostoli to win the middleweight crown. Pacquiao’s toughest competition: Erik Morales, Marco Antonio Barrera and Juan Manuel Marquez. Except for his KO of a used up Morales, he struggled against all three. True, these were the best fighters in the super featherweight class, but they are not in the same league as Ceferino’s top tier competition. Garcia fought about once a month (as did most of his contemporaries). The man had to know what he was doing to fight so often and survive in the torrid middleweight and welterweight divisions of the 1930’s. There were plenty of opportunities to perfect his craft. Manny, on the other hand, won his first title in his 25th pro fight in 1998, after beating mostly nobodies. Over the next 10 years he won titles in two more weight divisions but has fought only 28 times, averaging less than three fights per year. (Compare: In one two-year period (1933 and 1934) Garcia fought 37 times. And in one six week period in 1922 Pancho Villa fought 7 times. Manny is now bigger, stronger and a bit more experienced but not much better than he was eight or ten years ago. Garcia is a better puncher (62 KOs) and a better all around boxer than Manny, who catches way too many punches. Garcia consistently faced much tougher competition. He would be much more dangerous for Pacquiao than a 36-year-old over-the-hill De La Hoya. At welterweight, Garcia is too big and strong for Pacquiao and would stop him. Flash Elorde: Like Manny, Elorde was a junior lightweight and a southpaw. But that’s where the similarity ends. Flash was not as rugged as Manny and his style not as colorful—or reckless. Unlike most Filipino fighters, who are aggressive and love to mix it up, he was a slick, highly intelligent boxer with a busy right jab and good footwork. He was out-boxing featherweight legend Sandy Saddler when stopped on cuts in the 13th round in 1956. Only the great Carlos Ortiz was clearly superior. Elorde, who was slightly past his peak when he fought Ortiz, was competitive but lost by KO in the 14th round in their two title fights. That said, Manny, with his pressuring but careless style would be very vulnerable to Elorde’s quick counters and sharp punching. If he didn’t stop him Flash would out stab and outmaneuver Manny and win by a comfortable margin.